Tejay van Garderen will return to racing at the Tour of Britain this Sunday, 2 August where he will make his debut at the eight-day stage race, which features a 14km team time trial. 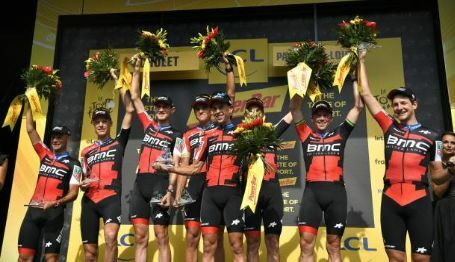 Van Garderen and his teammates will target victory in the team time trial on stage 5, Sports Director Valerio Piva said. “The main objective for the team is a stage win, particularly the team time trial on stage 5. It will be good practice for the upcoming UCI World Championships and with the uphill finish it will be a hard course. The Tour of Britain always attracts a strong field and it is a difficult race to control, particularly with only six riders and often bad weather, so for the General Classification we will take things day by day,” Piva said. Van Garderen is excited to race in Britain for only the second time in his career after the Grand Depart of the 2014 Tour de France. “I decided to forgo the Vuelta a Espana for the OVO Energy Tour of Britain in order to best prepare for the World Championships, in particular the team time trial and individual time trial. The fast, rolling terrain, as well as the stage 5 team time trial, should offer the perfect build up,” van Garderen explained.